Released under the GNU GPL license, GNU Image Manipulation Program is a free and open source raster graphics editor. The program, also abbreviated to GIMP, is a multipurpose application allowing image retouching, free form drawing, converting between different image formats, and some more specialised tasks. It was developed by the GIMP Development team in the year 1996 almost 22 years ago. The latest version of GIMP has the following features. 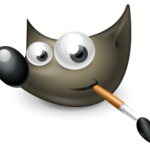 GIMP is a cross platform application that is compatible for Linux, macOS, and Microsoft Windows. However, the size of the program varies according to different operating systems. The Linux version requires 20 to 30 MB of space while the macOS one requires 55.9 MB free space. The Windows operating system requires the most space which is 85.4 MB. An image being edited in GIMP can consist of many layers in a stack. Each layer in an image is made up of several channels. Text layers can be created using the text tools provided with the tool box. It has support for several methods of sharpening and blurring images including the blur and sharpen tool. The program also has an integrated clone tool which helps in copying pixels using a brush. The Smudge tool can be used to subtly smear a selection where it stands. How to download GIMP 1.0.4? We are an unofficial resource website and not affiliated with The GIMP Team in any way.